The Fly Mushroom is one of the most dangerous. It grows very abundantly in July, August, and early September. It is attractive in appearance and gorgeous in coloring, but its fair exterior is a snare and delusion. 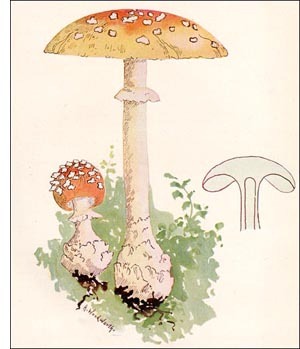 To it and its blood relatives probably may be attributed most, if not all, of the deaths from mushroom poisoning. It is commonly conceded that its family is the only one which is fatally poisonous, although there are others which produce unpleasant illness. This particular member of the family is mentioned because it is very common. In examining this mushroom, one should not pull it ; dig it up carefully and be sure to lift all of it. When matured it will weigh perhaps half a pound. It is usually of an orangeyellow, fading to a pale color at the edge. Sometimes it may be pale yellow, again almost white. You will notice a number of raised, irregular whitish or yellowish spots or patches on the surface at the top. These are characteristic. The top is nearly flat in mature specimens, and sometimes measures eight or ten inches in diameter. If the baby growth is examined it will be noticed that it is almost globular. The gills are white and very regular, and are sometimes slightly tinged with yellow. On the stem there is a sort of ring or collar which is whitish or yellowish in color and of a thin texture. The lower part of the hollow or stuffed stem swells out and is distinctly bulbous at the bottom, and about the base there is a sort of cup or socket from which the stem rises. Above it, the stem is clothed with whitish or yellowish fragments of like texture to the ring. Sometimes these fragments are almost woolly and extend upwards for some distance. The flesh of this mushroom is white, firm, and very inviting. The gills are rounded at the edge and at the stem. The odor is pleasant and the spores are snowy-white. Altogether, there is nothing to warn the rash experimenter that it is not as good as it looks. You will find these decorative mushrooms in field as well as in woods; long ranks of them file away through the thin grass. Also one may see them standing in all their glowing color in evergreen woods, the fatal poison cup hidden by the deep green moss.